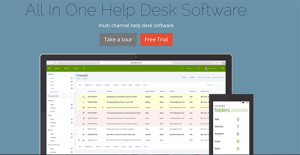 Vision Helpdesk is an all-in-one help desk platform for businesses of all sizes. Founded by the JPK Software Solutions Pvt. Ltd. in 2007, this award-winning help desk software was built to boost customer support services using top-of-the-line functionalities. From more efficient and consistent customer assistance to progress monitoring and process improvement, this platform can provide you with all the tools you need. Vision Helpdesk offers an intuitive yet easy-to-navigate interface and comprehensive tools that cater to the needs of both small and large companies. In addition to its basic help desk capabilities, it has a robust incident and problem management feature that can automate responses and organize service tickets. The customer support solution also provides a self-help community feature that allows you to set up forums and knowledge bases for your customers. A pioneer in satellite help desk software systems, this product is known for its multi-channel help features. Using this, it is easier and faster to manage various channels like calls, chat, email, web forms, Facebook, and Twitter without alternating between applications. Other notable features that this platform has to offer is its staff collaboration tool, help desk gamification options, and ITIL/ITSM modules. To top it all off, Vision Helpdesk can be deployed on-premise or as an SaaS, depending on the needs of your business. Help Desk Software (Multi-Channel Help Desk) – This product is a robust all-in-one multi channel ticket management software that allows users to centralize all their customer conversations via phone, chat, email, web portal, Facebook, and Twitter. Satellite Help Desk (Multi-Brand Help Desk) – This helps to manage IT service desk functionality or customer support for businesses having multiple companies, products, or brands at one place with a single centralized portal, and each brand or company can have its own branded client portal. Service Desk (ITIL/ITSM Desk) – This follows the discipline of IT service management (ITSM) as defined by the Information Technology Infrastructure Library (ITIL). This product is a service desk that includes CMDB, Release Management, Change Management, Solution or Knowledgeable Management, Problem Management, Incident Management, and Asset Management. Customer service professionals have multiple tasks to do on a daily basis. Because of this, it can be confusing for them to keep track of their responsibilities. In turn, this affects the overall performance of your operations. To help you streamline the workflow of your employees, Vision Helpdesk offers task management tools that can address delegation issues, balance workloads, perform ticket billing, carry out gamification solutions, and more. You may even set help desk automation settings to make your operations even more efficient. Customers have different communication preferences, so you have to make sure that you are easily accessible to them by providing multi-channel support. With Vision Helpdesk, you can integrate your help desk with various social networking sites, live chat systems, emailing management software, as well as VoIP platforms. This way, you can manage different modes of communication without having to jump from software to software. If you run multiple businesses, then Vision Helpdesk is going to be a boon for you. Other than being highly scalable, this software solution offers a multi-company help desk that lets you manage support operations for different companies, brands, or products from a single staff portal. Meaning, you won’t have to spend money on multiple Vision Helpdesk accounts to accommodate the needs of all your businesses. The platform even supports numerous customer portals so you can create separate help desk environments for each brand you own. Your customer support team represents your company, so they need to move as one entity. To ensure the consistency of your operations as well as to improve the quality of customer service, Vision Helpdesk has a staff collaboration tool called Blabby. This feature serves as a hub where your staff members can share knowledge-base articles and get comments and suggestions from colleagues while solving customer issues. There will always be room for growth. Make sure you continually enhance and polish your customer support services using Vision Helpdesk’s data reporting and analytics feature. These will provide you with in-depth insights regarding your performance, so that you can pinpoint the best ways to improve on them in the future. What Problems Will Vision Helpdesk Solve? Do you own several restaurants, run multiple retail stores, or own numerous websites? If you do, then, you know how difficult it is to consolidate your customer service efforts. You probably have separate phone systems per business in order to accommodate all of your clients. To save you time and money, Vision Helpdesk’s Satellite Help Desk provides you with a unified system where you can manage all of your company’s customer support requirements in one place. On top of that, you can choose to maintain complete isolation between incidents and customers of each companies for CRM purposes. Emailing is a crucial communication tool between businesses and customers, but this isn’t the only one you should be using for your help desk system. Since your clients are spread across different channels such as phone, chat, and social media, your business should cover as many of these as possible. With Vision Helpdesk’s multi-channel support feature, you can be more proactive when your customers reach out to you, which improves your overall customer service. Industry standards can be strict, and oftentimes, they are updated quickly. This is why it can be challenging to keep up with compliance changes while you manage your business. Luckily, Vision Helpdesk’s Service Desk is official certified as ITIL® compatible by Pink Elephant, a premier global training, consulting and conference service provider. This means their product is ITIL /ITSM Compliant with industry standards. Since each organization has unique business requirements, it is sensible for them to refrain from searching for a one-size-fits-all perfect software system. Needless to say, it would be useless to try to find such an app even among widely used software platforms. The intelligent thing to do would be to catalog the various vital factors that need consideration such as key features, finances, skill levels of staff members, company size etc. Then, you should do your homework thoroughly. Read some Vision Helpdesk reviews and investigate each of the other apps in your shortlist in detail. Such exhaustive homework can make certain you reject ill-fitting systems and choose the app that presents all the features you require for business success. How Much Does Vision Helpdesk Cost? Vision Helpdesk offers different enterprise pricing options depending on the type of license you need. We realize that when you make a decision to buy Help Desk Software it’s important not only to see how experts evaluate it in their reviews, but also to find out if the real people and companies that buy it are actually satisfied with the product. That’s why we’ve created our behavior-based Customer Satisfaction Algorithm™ that gathers customer reviews, comments and Vision Helpdesk reviews across a wide range of social media sites. The data is then presented in an easy to digest form showing how many people had positive and negative experience with Vision Helpdesk. With that information at hand you should be equipped to make an informed buying decision that you won’t regret. With its excellent assortment of useful features, this app is simple and effortless to use. What are Vision Helpdesk pricing details? What integrations are available for Vision Helpdesk? Pros: We have been presented with a really functional product which has a perfect and clean UI. Experience with them has remained a decent one right from the demo and has continued to sales, installation and now in the maintenance stage. According to me, vision helpdesk staff individuals who supported us during installation and in different stages play a major role in this. They have done a great job. Cons: Felt documentation can be more organized. They have all the data, however, felt it can be sequenced and organized better. Pros: "Vision helpdesk has helped the non-profit organisation that I am a part of in dealing with the large number of questions we get from people in general, in an easy and simple to tackle way. The product itself is easy and simple to work permitting us to set up the required components important to coordinate our needs. The customization of the mails and customer portals permits us to keep a steady brand while requiring little time spend on its overall look and feel. The product is fabulous however what truly sets apart Vision helpdesk is the support. When I am struck with an issue or have an inquiry I am given advice very fast. The Skype channel is especially helpful as it permits me to have a discussion directly in comparison to the email discussion. " Cons: There are a couple of functionality issues that I needed to discover workarounds for giving the short improvement cycles I am sure that the solution will include later on. Ease of use, Design, Features are the reasons that sets Vison Helpdesk apart frrom the others! After evaluating many helpdesk software providers we settled on Vision Helpdesk. This was for a number of reasons, firstly they provided an affordable self hosted one off license edition that was well without our budget. Many others out there wanted huge amounts of money for this type of edition. Secondly they provided a free trial so we could test. Upon installing we encountered an issue with our server not containing a piece of software that was require to run this helpdesk. We opened a ticket with Vision and within the hour they have logged into our server and resolved the issue for us, something they did not have to do. They are always friendly and willing to help. So, if you are looking for an affordable, reliable helpdesk software that is full of features then Vision Helpdesk is the one you need to choose. Trust me…you’ll never look back! I give Vision Helpdesk 100 stars!!! If you need more information about Vision Helpdesk or you simply have a question let us know what you need and we’ll forward your request directly to the vendor.